(Newser) – Oregon wildlife officials have started killing California sea lions that threaten a fragile and unique type of trout in the Willamette River, a body of water miles inland from the coastal areas where the massive mammals usually congregate to feed. The state Department of Fish and Wildlife obtained a federal permit in November to kill up to 93 California sea lions annually below Willamette Falls south of Portland, Oregon, to protect the winter run of the fish that begin life as rainbow trout but become steelhead when they travel to the ocean, the AP reports. The adult male sea lions, which weigh nearly 1,000 pounds each, have learned that they can loiter under the falls and snack on the vulnerable steelhead as the fish power their way upriver to the streams where they hatched. As of last week, wildlife managers have trapped and euthanized three of the animals, says Bryan Wright, project manager for the Oregon Department of Fish and Wildlife's marine resources program. The sea lions are eating so many winter steelhead at Willamette Falls that certain runs are at a high risk of going extinct, according to a 2017 study by wildlife biologists. Wildlife officials moved about a dozen sea lions to the coast near the small city of Newport last year, but the animals ended up swimming back to the falls within days. 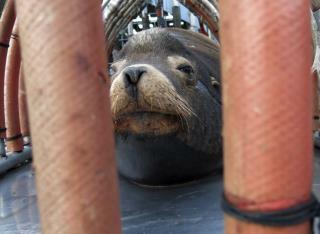 Before a sea lion is killed, the state must find out if there is a zoo or aquarium that wants the animal. If so, Oregon wildlife managers must hold the sea lion for 48 hours before killing it. More than 150 sea lions have been killed in a similar program on the Columbia River. so no sanctuary place for them huh? too bad they don't vote dummyrat. Relocate a few bears temporarily to the area where the seals are. They’ll stick to the ocean. And if culling is absolutely necessary, dump the carcasses where polar bears can stumble on them, without the bears associating the seals with humans and creatiya dependency. Once again, I cant help thinking how many people are so much more deserving of this fate than these guys. But bad decisions are the rule these days, rather than the exception. Live and let live.